U.S. Attorney General Eric Holder announced Monday that Khalid Sheik Mohammed, the alleged mastermind of the 9/11 terror attacks, and several accused conspirators will face military — not civilian — trials at Guantanamo Bay, a change in President Obama’s earlier goal of trials in federal courts. 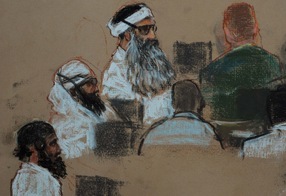 Khalid Sheikh Mohammed has been held at Guantanamo Bay since 2003, his capture in Pakistan, Prosecutors say he was not only a key figure in the planning of the 9/11 attacks but was also involved in a series of other high-profile incidents of terrorism, including the attempted shoe bomb and the murder of journalist Daniel Pearl. Mohammed is among the detainees believed to have been waterboarded by U.S. interrogators. Holder said he concluded that “the best venue for these trials was federal court,” but that since then “members of Congress have intervened” and imposed restrictions making it impossible. “They have taken one of the nation’s most tested counterterrorism tools off the table and tied our hands in a way that could have serious ramifications,” he said. Holder said he believed the case, as it was prepared by prosecutors, could have been tried fairly and successfully in Manhattan. “Sadly, this case has been marked by needless controversy since the beginning but despite all of the arguments and debate it has engendered…[it] should never have been about settling ideological disagreements,” he said.